Article taken from Good Old Boat magazine: Volume 1, Number 1, June/July 1998. If you own a sailboat, there is a good chance that you recognize the Atomic 4 engine by name, even if you don't have one in your boat. If you have a gasoline auxiliary engine in your boat, chances are it's an Atomic 4. Many good old boats have them; there were about 40,000 Atomic 4s built, and about 20,000 of them are still pushing sailboats around. While common, these engines are also controversial. 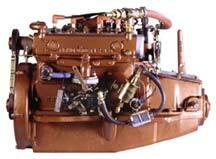 Most respected authors who write about sailboat engines say if you don't have a diesel engine, you should get one. They caution that it will be expensive to convert, but counsel that it is necessary. This point of view is so widespread, we don't know of any production inboard auxiliary sailboats offered today with gasoline engines. Indeed, to our knowledge there is no gasoline engine in production that would be a good candidate for this application. Marine architect Dave Gerr and Practical Sailor editor Dan Spurr are respected authors who take the other tack. They point out that it may be difficult to justify the cost of converting from gasoline to diesel. We have been told that one quarter of a cup of gasoline evaporated into the correct amount of air will explode with the destructive force of six sticks of dynamite. It makes you think. Before you become overwhelmed with fear and diesel envy, however, take a walk down your dock, and ask a few diesel sailboat owners if they have engines for their dinghies. The truth is that just about every cruising sailboat has at least a quarter of a cup of gasoline aboard regardless of what the main engine fuel is. All of us have to be very careful with gasoline. Automobiles have a good, though not perfect, safety record with gasoline. An automobile engine compartment is like an upside-down bowl. Leaking fuel and vapors fall down - out of the engine compartment and away from the car. In addition, cooling air from the radiator helps ventilate the compartment. We have never seen a production automobile engine compartment that was enclosed at the bottom. Although it might be desirable to do so to reduce drag, it simply is not worth the risk. Marine inboard engine compartments are also shaped like a bowl, but the container is right-side-up. The problem is caused by gasoline vapor being heavier than air, so it tends to fall to the bottom of the bowl, where it can be ignited by sparks or flames. This is a major concern for any vessel that carries gasoline. From a safety standpoint, we must consider that most small power boats use gasoline, and most sailboats carry gasoline for their dinghies. Your safety will be enhanced if you know how to handle this fuel and adhere to very strict and thorough safety measures to prevent fire and explosion aboard your boat. Taking out your Atomic 4 will not greatly enhance your safety though, unless you also remove your dinghy fuel and perhaps your stove fuel as well. How do you use your boat? It is best to buy a boat suited to doing what you do most often. It is probably a mistake to buy a globe-circling bluewater cruiser if you sail weekends with an annual two-week vacation. A coastal cruiser is better for this kind of work. This reasoning applies to your choice of engines as well. Don Moyer, of Moyer Marine, is a notable advocate of the Atomic 4. He points out that a lot of older boats are being purchased by young buyers. Many of these starter boats are "project boats" built in the early days of fiberglass. Some are boatyard queens that are being brought back from near-terminal neglect. They don't cost a lot of money to buy, but they will often require a great deal of owner labor to put them back in shape. Many of them are smaller coastal cruisers, and many have Atomic 4 engines. The engine is enjoying a resurgence of popularity. Click here to read more about Don Moyer. It's difficult and unreasonable to convince these buyers that they should pay for an engine swap that may double the dollar investment in their boat. The Atomic 4 burns about twice as much fuel as a diesel will burn to go the same distance. On the other hand, how much fuel will a sailboat use in a year? If you motor out of your marina and set sails, it is hard to go through a tank of gas in a year of weekend and vacation sailing. If you motor in calms and very light air, you will burn a little more. Last year, we estimate that we motored Mystic, our C&C 30, 400 miles on summer weekends and a couple of two-week vacations. Without being too precise with the math, it would cost $75 per year more to feed an Atomic 4 than to feed our diesel. If an engine swap costs $3,000 to $6,000, the payback in fuel savings might take 40 years. And those were used diesel prices. New diesel swaps go for roughly $6,000 to $9,000. Like fuel efficiency, an argument about operating hours between major overhauls favors the diesel. The cost of a major overhaul probably would not favor the diesel but is more difficult to compare. More importantly, both engines will run so many hours between overhauls that it is difficult to be certain that either one will need an overhaul before a boat is sold. The resale value of a boat may be greater if it has a diesel, but there are still buyers for both. If the Atomic 4 is in good health, the economics simply are not there for some owners of coastal cruisers to convert to diesel before the engine needs to be replaced. Mark Bressler is restoring Horizon, a beautiful Tripp 30 designed by William Tripp Jr. When he bought the boat, the engine had no compression to speak of. He determined that the exhaust valves were stuck. Because the engine had been unused for a long time, he feared other corrosion problems and replaced the original Atomic 4 engine with a used one that he located at a boat show. We asked him about routine maintenance. He said you need to change the oil and make sure the engine gets good, clean fuel. This much will be required by any diesel. Mark also said it is necessary to change the plugs once in a while, but this task is not difficult, and the electronic ignition makes the engine less fussy about plugs. What Mark didn't say was that among shade-tree mechanics and do-it-yourselfers, gasoline engine repair skills are more common. The routine maintenance on either type of engine is not particularly difficult. Bacteria can grow in diesel fuel and will cause trouble if it is not filtered out before reaching the injection system. On the other hand, gasoline engines require occasional spark plug replacement. In addition, the breaker points and condenser will have to be replaced occasionally, if the engine does not have electronic ignition. And while we are on that subject, it is worth mentioning that we have convinced more than one reluctant Atomic 4 to start by simply wiping a clean cloth between the points. It makes electronic ignition seem like a good upgrade. The availability of parts is another matter. Both Alan Abrahamsson of Old Lyme Marina and Don Moyer of Moyer Marine were cautious when asked about availability of parts. Certainly, routine maintenance parts are abundant. Major repair parts, such as blocks and camshafts, are available now but may not be forever. Mark Bressler is keeping his old engine for spares. The BoatU.S. catalog shows 20 common Atomic 4 repair items, including gaskets, ignition, and pump parts. The Alberg 30 Web site: http://www.alberg30.org shows an extensive listing of spare parts and where to obtain them. The parts in this list are cross-indexed to several sources. Both Old Lyme Marina and Moyer Marine sell maintenance parts as well as major replacement parts - such as blocks, cams, and cranks - but these large components are salvaged from other engines. The future availability of major parts is influenced by the fact that the tooling to efficiently make these parts no longer exists. At present, good salvaged parts can supply the demand. Don points out, however, that as younger buyers put more older boats back in service, this picture could change. There is no cause for panic at the moment. If the estimates are correct, 40,000 engines were built, and 20,000 are still in service. They can draw on the other 20,000 for spares. Tom Stevens of Indigo Electronics offers a broad selection of upgrade parts for the Atomic 4. An electronic ignition, oil filter system, fresh water cooling system, electronic fuel pump, and high output alternator with a smart regulator are available. 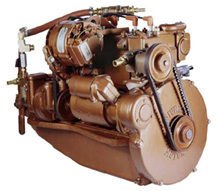 Indigo also offers a crankcase vent system that works on the Atomic 4 and the Palmer P-60 4-cylinder gasoline engine. The electronic ignition, in particular, enjoys an excellent reputation. Tom started his accessory business by designing an electronic ignition for the Atomic 4 - which did not always start as easily as he would have liked - in his own Tartan. Old Lyme Marina and Moyer Marine both sell rebuilt engines. These are high-quality engines that have been completely torn down and gone through. All components in these engines are inspected, evaluated, and replaced as necessary. They can be expected to give many years of reliable service. They list in the same price range as a used diesel. For many sailors, they may be the best option, because they truly "drop in," while any diesel conversion will probably be more complicated and involve additional expenses. The Atomic 4 has been criticized for not having a center main bearing, and indeed no modern high-compression engine is built today without a center main. In fact, some modern 4-cylinder engines have five mains instead of two or three. The Atomic 4 is not a high-compression engine however, and evidence suggests that it was a well-designed engine. Very likely, the designers knew that the center main would add several inches to the overall length of the engine and chose not to make it longer if they could solve the problem another way. Don has seen little evidence of broken cranks and recently sold off a "basement full" because they were outlasting the blocks. Alan says that cranks do break but the problem is really associated with the condition of the exhaust systems of the boats. He says many early exhausts were jacketed systems with a cooling jacket around the exhaust pipe. If the exhaust pipe corroded enough to leak, water from the jacket would enter the engine and get into the cylinders. If you have this type of exhaust system on your boat, it would be advisable to check it frequently for corrosion and, at the first suspicion of trouble, replace it with a properly designed waterlift muffler. Don points out that with any of the water-cooled exhaust systems, it is important to close the cooling water seacock if the engine is going to be cranked any period of time without starting. These situations include the first start after launching in the spring, compression testing, and any case of hard starting. The point is that the raw water pump keeps pumping water into the exhaust system, and there is no combustion exhaust to blow it back out again. In this situation, the exhaust system can fill up and drain into the engine. Naturally, as soon as the engine starts, the seacock must be opened immediately to prevent the exhaust system for overheating. At Old Lyme Marina, Alan says they sell all their remanufactured Atomic 4s with the Indigo electronic ignition upgrade, and he has never seen one fail. As noted earlier, you can always wipe the points once in a while, but if you like an engine that starts dependably, this upgrade might be very attractive. Alan also suggests that in boats where the fuel tank is higher than the carburetor (the common arrangement), it is worthwhile to shut off the fuel valve from the tank when the engine is not in use so if the float gets stuck, the carburetor will not overflow. Another potential problem mentioned on the Alberg 30 Web site was the possible failure of the mechanical fuel pump diaphragm. If this part fails, the engine will get fuel in the oil. An indication of this failure is a strong gasoline smell on the dipstick. An electronic fuel pump is available to eliminate this failure point. The short of it is that the Atomic 4 is not a particularly unreliable engine in its original form, and there are modern upgrades to make it better. To put the issue of reliability in perspective, it should be understood that few, if any, marine engines are as reliable and maintenance-free as modern automobile engines. In the case of older marine engines this statement is particularly true. Sailors should become familiar with their engines and be prepared to spend time learning about and maintaining them. Two other "aspects of use" are noise and availability of fuel. Although newer diesel engines are quieter than they used to be, the Atomic 4 is a very quiet and smooth engine. Depending on the replacement, there may well be more noise and vibration with the diesel. We have seen comments to this effect in some class newsletters. Also, because the majority of pleasure boats are gasoline-powered motor boats, gasoline is more readily available in some areas. Have you ever seen a public fuel dock that had only diesel? "Proper" care and "feeding" of your Atomic 4? He once raced on a 33-foot light displacement sloop named Diana K from Africa to South America. She had a gasoline engine - not an Atomic 4, but rather a British Ford. The engine was fueled by gravity from a tank under the cockpit seat. John thinks that an accessible fuel shut-off valve between the tank and the engine would have been valuable. On the return trip in the Roaring Forties, the boat ran into rough weather that lasted for weeks. The vessel was shaken so severely that gasoline from the tank forced its way past the float and into the engine. By the time the crew realized there was a problem, half the fuel was in the oil. We are not sure what happens if you shake the Atomic 4 violently for weeks without starting it, but John's suggestion of a shut-off valve may be good insurance. Most boats have a fuel shut valve, but they are not always accessible. The Atomic 4 is a good engine, but in some cases owners may want to consider the diesel alternative. If you convert to a diesel, the range of your boat for a given amount of tankage will be roughly double. If you sail offshore or in remote cruising areas where fuel is not readily available, this can be an important consideration. If your boat is fairly large and/or valuable, you may find the diesel option more appealing. Larger boats can effectively use the power of a four-cylinder diesel and may have more room for one in the engine space. Trading from the Atomic 4 to a four-cylinder diesel will not be as much of a comedown in smoothness. If your boat is quite valuable, you may not find the cost of conversion to diesel to be such an unreasonable percentage of the total investment. In some cases the diesel may even be an expectation on the part of your boat's next buyer. If you are going on an extended cruise where fuel costs may become a significant part of your budget and where you may expect to do an unusually large amount of motoring, a more efficient engine has a better chance of paying for itself. The inland waterways of the East and Gulf coasts are examples of places where a sailboat engine will see many hours of use. There are several manufacturers making diesel engines intended to replace the Atomic 4. Westerbeke, which bought the line from the original manufacturer, sells both three- and four-cylinder engines for this purpose, and Kubota offers at least one 25-horsepower model that has been known to fit. These engines may or may not be drop-in replacements. Dimensional details should be checked very carefully. Remember that it is not necessary to match the 30-horsepower output of the Atomic 4. It was installed in a lot of boats that could not use anything like the full power it can develop. Determine your actual horsepower requirement by calculation. Most diesels have a reduction gear, while many Atomic 4s did not. That means that a larger propeller may be required, and it may need to spin in the opposite direction. That is not all bad, but the tip clearance between the prop and the hull needs to be kept in mind. It is beyond the scope of this article to give all the considerations of converting to diesel; suffice to say that it is not always simple and straightforward. There are several good books on the subject, and there are yards that do repowering which can be valuable sources of information. Even though the Atomic 4 went out of production about 20 years ago, it is still being extensively used in older sailboats. It is well supported by rebuilders and parts suppliers, and it is well known among repair people. In many cases it is logical to repair it or replace it with another one rather than converting your boat to diesel. The Atomic 4 is a well-designed good old engine for our good old boats. Stringent safety measures should be taken by any boat carrying gasoline. If your dinghy runs on gasoline, as most do, you have a boat carrying gasoline. A few ounces of gasoline will make all the trouble you need. Whether the other 20 or 30 gallons on board are diesel or gasoline won't make too much difference. Kristen Chambers, Senior Project Administrator at the BoatU.S. Boating Safety Foundation provided Good Old Boat with statistics on fire-related boating accidents reported to the United States Coast Guard. She also provided excerpts from Seaworthy, a loss prevention newsletter that goes to sailors insured by BoatU.S. The information provided by the Coast Guard does not distinguish between gasoline and diesel accidents, but for 1995 and 1996, 79 incidents of fire were reported. Of these, 61 involved ignition of spilled fuel or vapor, 15 were categorized as failure to vent, and three were categorized as fuel system failure. It is likely that the cases classed as "ignition of spilled fuel or vapor" were cases involving gasoline, since it is very difficult to ignite diesel fuel in this way. Chapman's Piloting, Seamanship, and Small Boat Handling offers a somewhat elaborate procedure for refueling a boat. It may seem overly complicated, but perhaps not when you consider that most accidents involving fire, in the statistics noted previously, were caused while fueling or in the first few minutes after fueling. Before you fuel, inspect the fuel system, particularly the fuel fill and piping. A lot of trouble is caused by broken deck fittings or associated piping and hose. Look also at the place where the fuel fill hose and vent hose connect to the fuel tank. These locations are often below the fuel level after refueling. Shut down anything that can make a spark or flame, and close up your boat. Fuel vapors are heavy and will "spill into low spots." Remember that when you take on 20 gallons of fuel, you will displace and emit roughly 20 gallons of fuel vapor. Make sure you put the fuel into the fuel fill. If you don't do the filling yourself, watch to see that this is done. People have been known to accidentally put fuel into fresh water and holding tanks. Other holes that you would never consider - such as fishing rod holders and fresh air vents - have also been the erroneous receptacles for gallons of fuel. Don't delegate this task. To avoid static charge buildup, make sure the nozzle is in metal-to-metal contact with the fuel fill. Don't use plastic funnels. Take portable containers off the boat to fill them. Remember, too, that the fuel is probably coming out of a ground tank and is colder than it will be later; leave room for expansion in all tanks and containers. Stow portable tanks so they cannot be upset, no matter how violent the motion of your boat gets. Ventilate your boat using your bilge blower. Ventilate until all the fumes are out, generally at least four minutes. Since heavy vapors will "pour into" low spaces, use your nose to sniff for fumes in the lowest spaces on the boat. Do not start up and leave the fuel dock until you are sure you have no problem vapors and all the fuel went into the tank(s). Open the battery switch. It's a good idea to open it anyway during fueling so fewer circuits are live and capable of causing sparks. Don't turn on the bilge blower in this case. It could make a spark or add enough air to fuel vapors to make them explosive. Get the crew off the boat, and don't make any sparks or flames while cleaning up. Finally, consider the spaces where you store all your fuels. Spaces that store fuels should ideally be vented overboard at the bottom of the space, in much the same way that propane is stored. This next part is controversial. It represents Good Old Boat magazine's opinion. We had no problem finding disagreement with our opinion; we offer it here anyway. We suspect that the design of many boats did not anticipate the need to store portable gasoline tanks. This may be particularly true of some boats with diesel engines since we are told that diesel-powered boats are not required to have ignition-proof components in the engine space. In our own observation, we see that the majority of boats have gasoline-powered dinghies, and we almost never see gasoline tanks lashed down on deck. One industry authority told us (when reviewing this article) that the improper stowage of portable gasoline tanks aboard sailboats is not a problem, but we know that many good old boats really have no safe place below decks to store portable tanks.